In part three of our interview with security expert Sunil Ram, Sunil provides his answer to the hypothetical 3a.m. phone call from the new US president over what to do in Afghanistan. 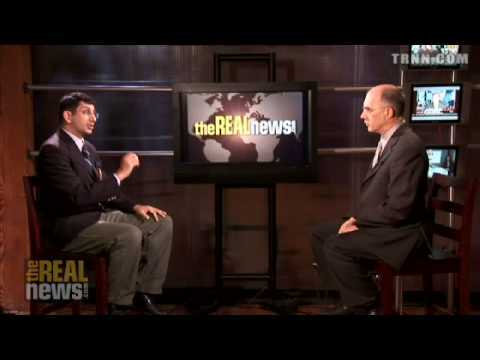 Sunil advocates for the replacement of the Karzai administration with a western military rule along with the open engagement in the Afghani drug economy, thus removing the financial lifeline of the warlords and the Taliban as well as providing economic stimulus to the Afghani population in a more effective way than the aid programs that are already in place. The opium could be marketed as a pharmaceutical product, as advocated by the Senlis Council, or even burned immediately, believes Sunil, but it must be taken out of the hands of the traffickers. Sunil attributes the unwillingness to pursue an active drug strategy not to a state of ignorance of the role of drug money, but rather to a combination of corruption and a general preference within the administration toward focusing on Iraq, a preference that has been present since day one. DANNY GLOVER, ACTOR, FILMMAKER, ACTIVIST: Hi. I’m Danny Glover, and I’m a big supporter of The Real News. I watch The Real News every day because it’s our station. It belongs to us. PAUL JAY, SENIOR EDITOR, TRNN: Welcome to the next segment of our interview with security expert Sunil Ram on the recent events in Pakistan. Sunil is a former Canadian military officer, as well as a former military adviser to the Saudi royal family, currently works with the consulting group ALEXIS International. Welcome, Sunil. So when we left off in the last interview, I said, "You might get a phone call." Actually, I doubt it, but let’s say you get the famous 3 a.m. phone call, and assuming it’s a President Obama and he says, "What should we do with Afghanistan?" what would be your answer? SUNIL RAM, SECURITY ANALYST, ALEXIS INTERNATIONAL: My first suggestion is get rid of the Karzai regime. Implement some sort of a military rule over the country. You would have to secure the Afghan police and Afghan army. There are certain elements that are—. JAY: "Military rule" meaning American military rule. RAM: Well, for NATO, however you want to call it. Western, for a general veneer. Stop the idiocy of drugs isn’t the issue, because drugs is the elephant in the room. Without the drugs fueling the furnace of arming the Taliban, you’re simply not going to be able to deal with that issue of quelling the war. JAY: But doesn’t a strategy like that lead to a general uprising of the population against the foreign occupation? RAM: No, because in this—. JAY: And don’t they need this Afghan-looking government? RAM: Well, I don’t think so, because when you look at the average Afghan, the government doesn’t do much for them. It’s foreign aid that does the little it does. So what little security exists is predominantly from NATO forces, because you can’t necessarily trust your local Afghan policeman, because chances are he’s in the pay of the local warlord who’s involved in the drug trade. JAY: Well, they’re talking about, in the next Afghan presidential elections, that the former American ambassador to Afghanistan might run. If he were to win, they kind of get their cake and eat it in some sense of the words. RAM: Potentially. And then you have to deal with the Taliban themselves, and you’re going to have to negotiate. And the whole drug eradication program is foolish. It’s a waste of time. It has been to date. The numbers again prove it: if it was working, we wouldn’t see, you know, 10,000 to 15,000 metric tons, as opposed to the 150 or 300 tons during the Taliban era. So there’s a substantial difference here. So eradication obviously doesn’t work. So the result is we have to find an economic outlook, and the bottom line is all the mumbo-jumbo of aid that everyone talks about is barely a drop in the bucket relative to the drug economy. JAY: So how do you change the drug economy? RAM: Well, you have to work with the drug economy because it’s there. What do you do with the drugs? Now, fair enough. The Senlis Council out of England has come up with at least a commercial use for the drugs. RAM: Absolutely. There’s a potential outlet for the acquisition. JAY: They did quite a detailed study, right down to where the stations would be and how you would do the interactions. JAY: But on the whole, NATO and the American military just dismiss this as pie in the sky. RAM: Well, absolutely. But let’s look at some pragmatic issues here. There is a physical cost in having troops and personnel there. There is a physical cost to losing an armored vehicle. Let’s take the LAV-3. It’s a simple example ’cause it’s the most ubiquitous armored vehicle there, or similar vehicles. These vehicles cost $1.4-$1.5 million a piece US based on that configuration, and they lose one of these vehicles a week. You could buy an awful lot of opium and burn it if that’s what you got to do—and that’s what you should do. But you’re at least putting money in the hands of the local Afghan people, and you cut out the warlords. The warlords can’t finance themselves if they don’t have the drugs. And instead of worrying about what’s going to go on on the Pakistan border, you simply sit there as a sealing force, and there’s plenty of troops to do that. It’s a defensive scenario: you’re in a better position; you block the main pass. Everybody knows the routes the drugs come out on. So that’s a pragmatic way of doing it, and it is very cost-effective. It’s a lot cheaper than constantly losing soldiers. And the Americans and the NATO allies losing soldiers on a regular basis, the average Western soldier costs about $1 million to replace. These are the hard numbers nobody ever talks about. JAY: So it seems kind of rational and obvious. Why aren’t we seeing this kind of a policy already? RAM: Well, again, we have the hypocrisy of the United States at work in Afghanistan. What was Afghanistan really about? It was an excuse for an invasion of Iraq. Afghanistan was never where the Americans wanted to go, in fact wasn’t until Colin Powell insisted on the invasion of Afghanistan, what became the Afghanistan-first policy. The Bush administration [inaudible] immediate invasion of Iraq. And Powell said it. JAY: But since that time, this idea of just buying the drugs and not allowing the Taliban—. I know Hamid Gul, the former head of the ISI, he’s been quoted—and he should know, ’cause he had a lot to do with setting up the Taliban—he’s been quoted as saying the Taliban are getting as much as a 10 percent cut on everything that’s leaving Afghanistan, which is an enormous amount of money. RAM: Well, that number indicates about $100 million at least. RAM: Exactly. Common sense says it, and the money’s—. JAY: So why isn’t it happening? I mean, is the reason it’s not happening is ’cause too many people make money out of it under the current situation? RAM: Well, absolutely. Look at the Karzai regime itself and the fact that, you know, we go back to the whole issue of his role with Unocal and the pipelines and things like this. When you look at chaos in Afghanistan, the chaos tends to be in one general area, which tends to be in the drug-producing regions. But the fact is is that the economy of Afghanistan is a drug economy. That’s what you’ve got to work with. The reality is that all this pointless aid money can be simply poured into that, and all of a sudden you would have a level of stability where the aid would work. JAY: Because you’d have some real consumer purchasing power [inaudible] ordinary Afghans. RAM: Exactly. And again what we have is the typical situation of the West pouring money in, using their Western models and social ideals and ethnocentricities in the application of what they perceive to be law and order in a region that doesn’t operate that way. JAY: Well, thank you very much for joining us. And if you do get that 3 a.m. phone call, you do need to tell us, and we’ll continue this later. Thank you very much. JAY: And thank you for joining us for our interviews with Sunil Ram.